Joseph is sold as a slave to Potiphar, a minister in Egypt. Potiphar is satisfied with Joseph's work and promotes him. Potiphar's wife is also interested in Joseph and tries to attract him. When he rejects her, she lies to her husband and Joseph is thrown in prison. While in prison, Joseph meets Pharaoh's chief baker and chief butler. They both have strange dreams, which Joseph interprets. He tells them that in three days the butler will be released and the baker hanged. Joseph's predictions come true but for now he remains in prison. Later on Pharaoh dreams of seven fat cows that are swallowed up by seven lean cows, and of seven fat ears of grain swallowed by seven lean ears. He wakes up concerned and demands his dreams to be interpreted. The butler remembers Joseph and Pharaoh sends for him. Joseph interpretation is that seven years of plenty will be followed by seven years of hunger. He advises Pharaoh to store grain during the plentiful years. 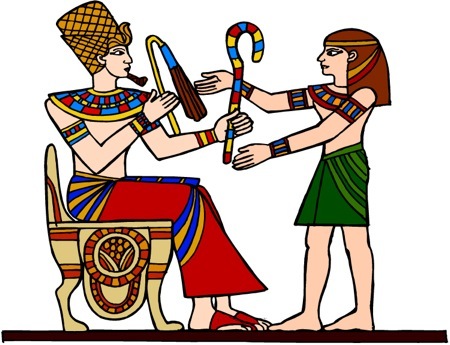 Satisfied with the dream interpretation, Pharaoh appoints Joseph governor of Egypt. 1. God gives each of us special gifts, certain talents if you will. At first Joseph's talent caused for his slavery and imprisonment but later it helped him become governor. What are your talents? How do you use them to help other people? 2. Life is a process and we are all part of a bigger picture. If Joseph was not sold as a slave he would have never ended up in Egypt and later as a governor. Even when things seem to go wrong in our life, we must believe that in the end everything will work out for the best.